I (surge919) successfully tied in OwnTracks to Home Assistant and SmartThings while using authentication for external access. 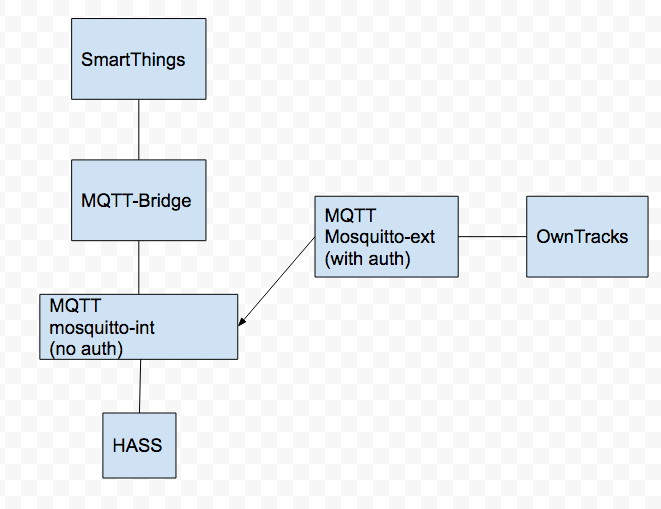 The MQTT bridge doesn’t support authentication so I set up 2 MQTT instances. Here are the steps I performed. Hopefully it saves someone else some time. It seems to be working pretty well but if anyone sees something incorrect in my configuration, please let me know. This is my first real interaction with MQTT. All Docker configuration files are on my NAS so the Docker containers can be destroyed without affecting my actual configuration files. Docker setup for the Mosquitto internal instance. No authentication for use with the MQTT bridge. Docker setup for the mosquitto external instance. With authentication for use with Owntracks.